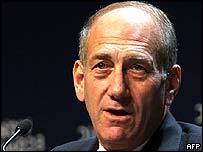 Ehud Olmert became prime minister in the April 2006 election after the centrist Kadima party - which he then led - won the most seats. But his premiership was almost immediately overshadowed by what many Israelis saw as his bungled war against Lebanon's Hezbollah in the summer of that year. In the face of severe public pressure, the government established a committee - the Winograd commission - which examined the government's handling of the war. The commission accused him of "serious failure in exercising judgement, responsibility and prudence" during the 34-day war with Hezbollah. Mr Olmert's term in office was also shadowed by corruption allegations dating from earlier in his career. He denied any wrongdoing but, under growing pressure over multiple corruption investigations, announced in July 2008 he would step down as party leader. His trial on corruption charges opened in September 2009. Foreign Minister Tzipi Livni was elected party leader two months later but Mr Olmert remained prime minister after Ms Livni failed to put together an alternative government. He left office after general elections were held on 10 February 2009. Six months later, Mr Olmert was charged in connection with three corruption cases, accused among other things of accepting envelopes full of cash from an American businessman and defrauding Israeli charities by overclaiming travel expenses from them. In early 2010, he became embroiled in a further corruption scandal - the so-called Holyland Affair. Officials are alleged to have taken bribes while he was the mayor of Jerusalem to speed up a controversial residential development in the heart of the city. Mr Olmert rose to prominence under former Prime Minister Ariel Sharon, serving as deputy leader and finance minister in the previous government. He became leader of the Kadima party after Mr Sharon was admitted to hospital in January 2005 following a massive stroke - he is still in a coma. Mr Olmert was widely seen as one of Mr Sharon's closest allies. He unequivocally supported Mr Sharon through every step of the Gaza evacuation process when Israel withdrew from all its settlements in the territory and four others in the West Bank. He also followed Mr Sharon in November 2005 when he left the right-wing Likud party to set up the more centrist Kadima. Mayor of Jerusalem from 1993 until he joined the cabinet in 2003, Mr Olmert has adopted a slightly more dovish line in recent years, relative to senior figures in his former Likud party. As deputy prime minister, he gained a reputation for floating controversial ideas, allowing Mr Sharon to gauge reaction and develop his strategy. As a reward for his support for the disengagement plan, Mr Sharon promised Mr Olmert a senior ministry post, starting with the deputy prime minister brief in February 2003. He caused uproar in political circles in December 2003, when he suggested Israel should pull out of the West Bank and Gaza Strip. He said in a Yediot Aharonot newspaper article, that a withdrawal was the only way for Israel to stay democratic and Jewish. He warned that the high Palestinian birth-rate meant Arabs would soon outnumber Jews in Israeli-controlled territories. For Israel to remain a Jewish state, he said, a new border would have to be created, with as many Jews as possible on the Israeli side. At the time, cabinet colleagues from parties representing Israeli settlers accused him of giving in to terrorism. Despite the initial controversy, the idea of disengagement became government policy, with a majority of Israelis backing the process. Mr Olmert was a long-standing rival of Benjamin Netanyahu, whom he replaced as finance minister in August 2005 when the latter stood down in protest at the Gaza pull-out plan. Mr Netanyahu, of the Likud party, replaced Mr Olmert as prime minister following elections in February 2009. Mr Olmert was born in Binyamina in what was then Palestine in 1945 and trained as a lawyer. His father was also a Knesset member. Before being elected to parliament in 1973, aged 28, he served with the Israeli army in an infantry unit. As mayor of Jerusalem between 1993 and 2003, he invested substantial resources on developing the city's road, water and sewage infrastructure. He was also a strong advocate of the expansion of the Jewish settlements in the West Bank surrounding the city.